(1) This lightweight adjustable universal boat hand dolly is equipped with a retracted main pole from 8′ to fully extended 10′, angle flexible rear bunks, and position adjustable front bow support bunk to carry the boat. The boat hand dolly weighs about 45 Lbs including two 16” Pneumatized wheels. 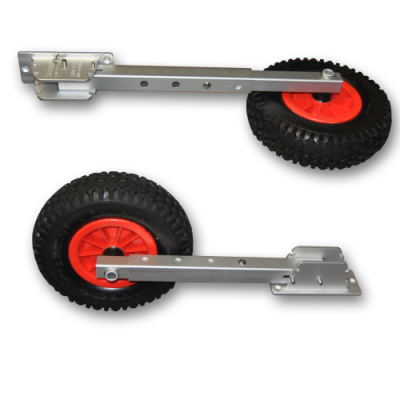 The disassembled boat hand dolly can be fit into an easy carrying box with approximate 50″ x 46″ x 9″ dimensions. 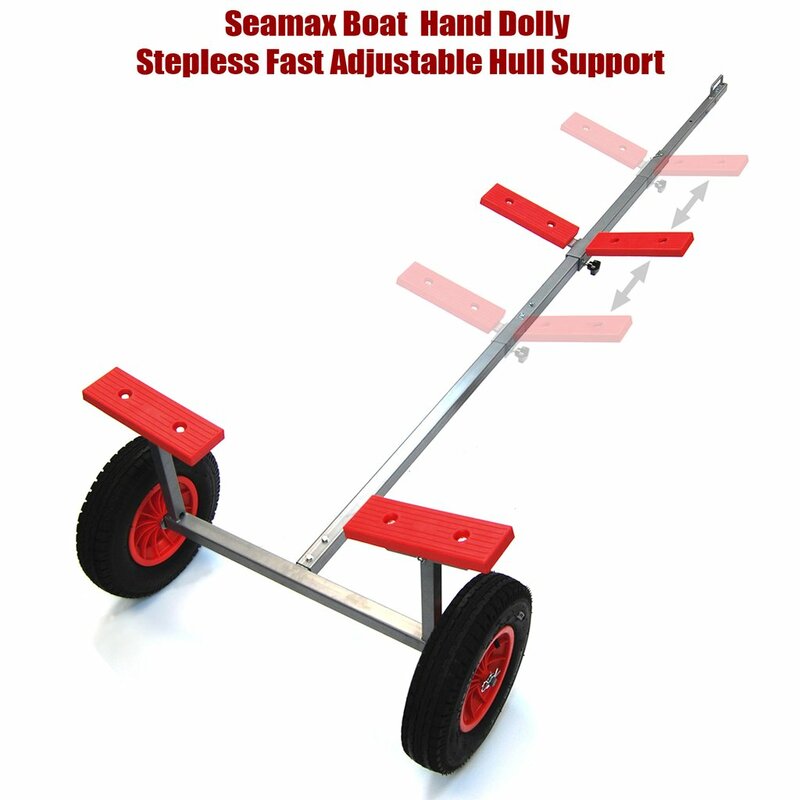 (2) Seamax Boat Hand Dolly is made by steel with power coating. Quick released lock pin to change the dolly tongue stages: 8ft, 9ft and fully extended 10ft. Rear Bunks Width 38”. Dolly Payload 250 Lbs for boat and motor. Suggested tire air pressure is 15 PSI, max 20 PSI. It is good for an inflatable boat up to 13ft, an aluminum or fiberglass boat up to 14ft, and a small sail boat up to 15ft. (3) Optional hitch attachment is available for off-road towing with an ATV, golf cart, and other utility vehicle. Max towing speed is 10km / hour. 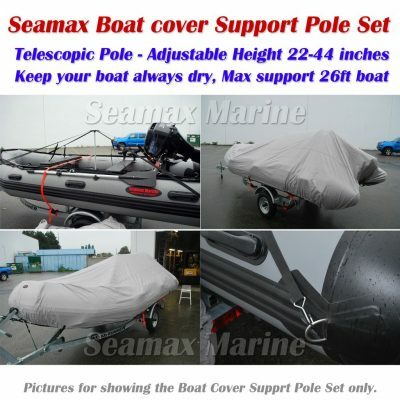 It is great for launching your boat to the water quickly. 10 minutes to assemble or disassemble. This product has been selling to many many places including sail club or yacht club. (4) Tire inflation: Dolly tires may not be fully inflated when shipping. 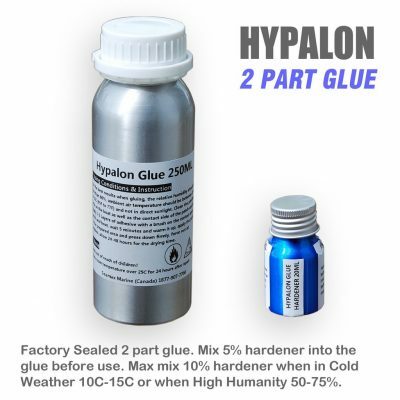 Give only 15-20 PSI max air pressure in room temperature before using. 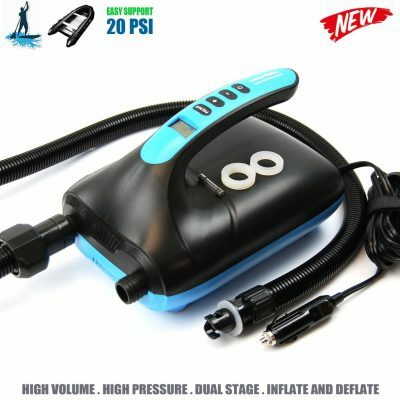 Best to use portable type digital control air pump to avoid over inflation issue. (5) The boat hand dolly is suitable for many use cases. For example, carry your boat from the parking lot to the boat launching lane in a park. Carry your boat from your backyard to the water. Move your boat within the yacht club or sail club. Users shall check the max pay load (250 Lbs) and speed (10 KM/Hour) requirements. The boat hand dolly is NOT for regular road / highway use. Boat hand dolly user cannot tow this hand dolly on the road or highway by vehicle for any of purposes. Wash it with fresh water after every use from salt water or sandy beach. Check tire pressure before every using. Do NOT store the wheels directly under the sun or beside any heat source to extend its usable longevity. Repaint and lubricate the dolly system when necessary. Keep the bolts, lock pin on the dolly. 30 days free replacement on any defective parts.